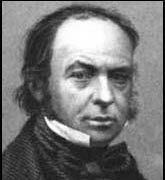 Isambard Kingdom Brunel (9 April 1806 – 15 September 1859) was a British engineer, who played a key role in the early industrial revolution. He built one of the first major railway routes – the Great Western Railway (GWR) between London and Bristol. He also designed and built steamships and pioneering bridges. Brunel was born in Portsmouth in 1806 to a notable engineer – Sir Marc Isambard Brunel, and his wife, Sophia. Seeking to follow in his father’s footsteps, he was sent to France to be educated at the Lycee Henri-Quartri and the University of Caen. In 1833, Brunel was appointed chief engineer of a new project to link London to Bristol by railway. This was in the infancy of the railway era, and it was one of the most ambitious projects to date. Brunel took to the project with his customary enthusiasm, dedication and innovative approach. He spent hours and days surveying the route, eventually deciding (controversially) on the flattest approach through Reading and Swindon (which at the time was only a small village). There were still many obstacles to overcome, and on the route, he planned and built several viaducts and several tunnels, such as Box Tunnel. At the time, Box tunnel was the longest in the world, and serious men of medicine even questioned whether it was safe at all. Brunel was a hard taskmaster, expecting others would share his same non-stop work ethic, (it was said he survived on four hours sleep a night). Like other railway builders of the time, he was harsh on the navies who risked accident and death in the construction of the railway. The navies worked under appalling conditions and they received little, if any compensation, from the company, should they be killed or injured. Brunel was never content to follow other approaches, and according to his own calculations, decided the best gauge was not the standard gauge other railways were using, but a wider ‘broad’ gauge. Brunel may have been correct to say this offered more stability, but it made railways construction more expensive and, more critically, it meant the Great Western Railway lacked integration with the rest of the network. When the network grew, the broad gauge increasingly hampered the lucrative freight traffic of the GWR because goods had to be transferred from one network to another. Eventually, after his death, Brunel’s broad gauge was converted, at significant cost, back to standard gauge. On other parts of the line near Devon, Brunel made an expensive mistake in hoping trains could be run on atmospheric pressure. A largely untried technology, it had to be abandoned when it proved impractical. 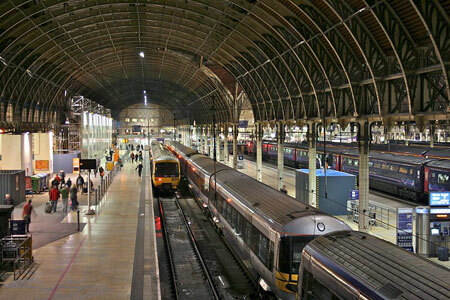 In 1854, Paddington station, designed and built by Brunel was opened; the GWR’s entry into London was considered another great success and is still in use today. Despite over-running on costs and making mistakes, such as the choice of gauge, the Great Western Railway proved a huge success and revolutionised travel between London and the West. Such a project clearly needed someone with the drive and vision of Brunel to move it to completion. At times, Brunel’s stubbornness may have been costly, but it was also his stubborn determination which got the project completed. 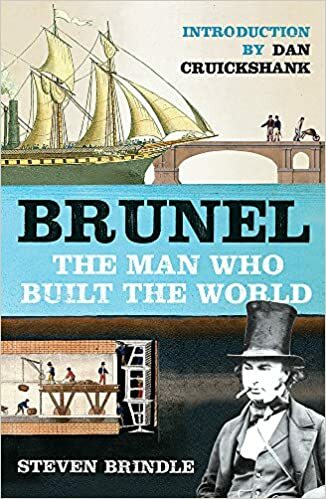 Brunel was a workaholic, and even as the GWR was still being built, he moved onto another project – a steamship for transatlantic shipping. 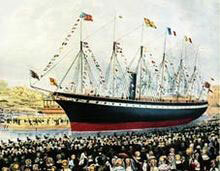 The Great Western sailed in 1837 and was the largest steamship in the world. Later, he would build the world’s first metal ship 1843 (the SS Great Britain, pictured left). This was a forerunner of modern ships around the world. Brunel is also famous for the building of bridges. 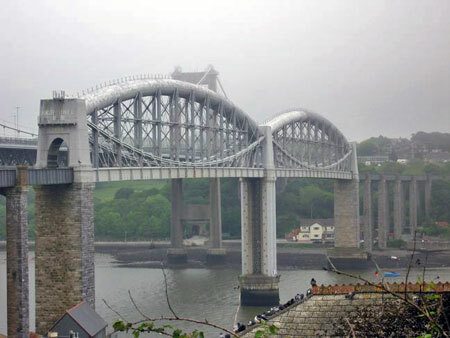 Many bridges needed to be built as the GWR extended south-west down into Cornwall. 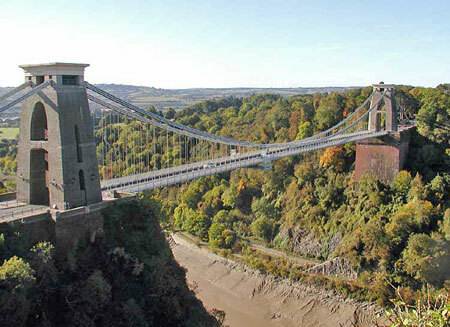 At the time, the Clifton Suspension Bridge was the largest suspension bridge in the world over 700 ft (213 m). Started in 1862, it was completed in 1864. Brunel’s work was remarkable for its wide-ranging scope. When Britain entered the Crimea war in 1854, Brunel was asked to make a pre-fabricated hospital which could be transferred to the region. The Renkioi Hospital was considered a great success for its attention to hygiene and sanitation. Florence Nightingale referred to Brunel’s creation as ‘those magnificent huts’. Brunel epitomised the energy and innovation of the era. With supreme confidence in his own abilities, he blazed a trail for others to follow. Always innovative, he left a profound legacy of design and engineering, which still is very much in use today. Brunel suffered a stroke in 1859, just before the Great Eastern made her first voyage to New York. He died ten days later at the age of 53 and was buried, like his father, in Kensal Green Cemetery in London. Citation: Pettinger, Tejvan. “Biography of Brunel”, Oxford, www.biographyonline.net Published 28th May 2010. Updated 10th February 2017. Famous people of the Industrial Revolution (1750s to 1900) The great inventors, entrepreneurs and businessmen of the industrial revolution. Also includes the social activists of the era, such as Charles Dickens.